The diplomatic accord struck between Iran and the international community in 2015 promised concrete steps towards normalizing relations long stifled by concerns of nuclear proliferation and economic sanctions. The resulting road map, the Joint Comprehensive Plan of Action (JCPOA), details commitments to lift sanctions and was therefore widely seen as opening the door to new business and investment opportunities in Iran. A number of new business agreements in the aerospace and energy sectors were announced following the agreement, furthering hopes of substantial change. 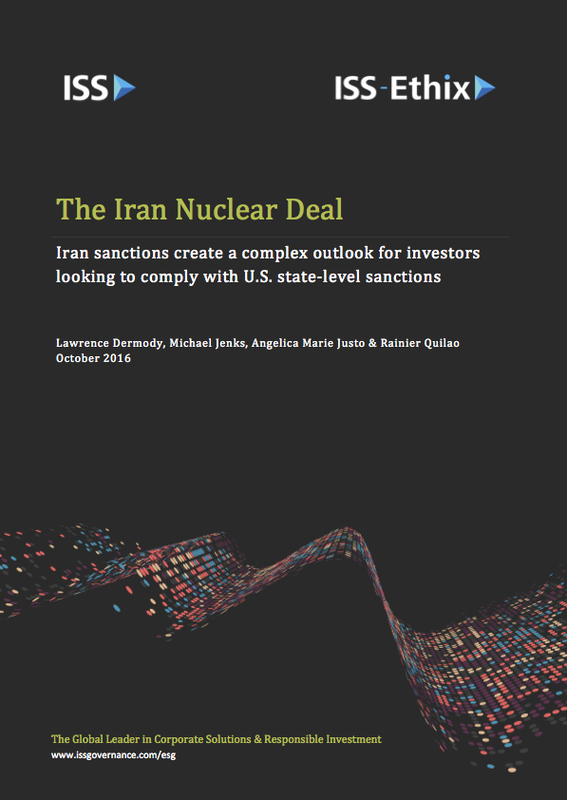 However, despite the initial scaling back of U.S. and multilateral sanctions on Iran, political and regulatory risks continue to stunt foreign companies entering the country. These risks, including a patchwork of U.S. state-level legislation and divestment policies, combine to constitute a uniquely complex outlook for investors during the next of eight years of the agreed-upon roadmap. This paper provides a discussion of the financial and trade sanctions with Iran and their impact on investors.